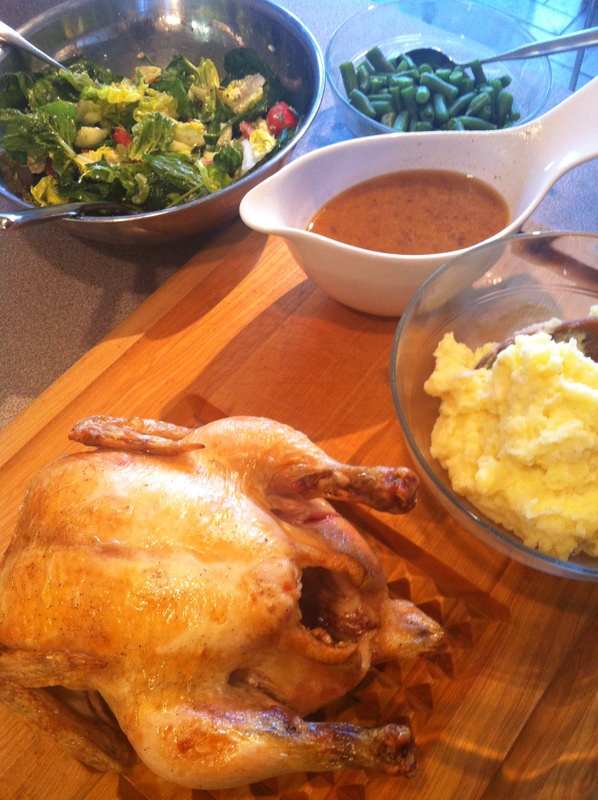 Still chilly here in Fort Wayne, so how about roast chicken and mashed potatoes? With gravy (made with whole wheat flour), salad, and green beans. All organic vegetables, but also an organic Miller’s Amish chicken (from Meijer). Yes, it is more expensive — but the taste is amazing. And it was still enough to feed all of us plus have a couple of pieces leftover for lunch the next day, so I felt like I got my money’s worth. Here’s a nice article from one of my favorite blogs, 100daysofrealfood.com, about why to buy organic chicken and how to roast one. However, what I need is a class on how to carve a roast chicken! (That’s why the photo was taken before I cut it up — poor pretty chicken). Then — finally! A nice warm day! 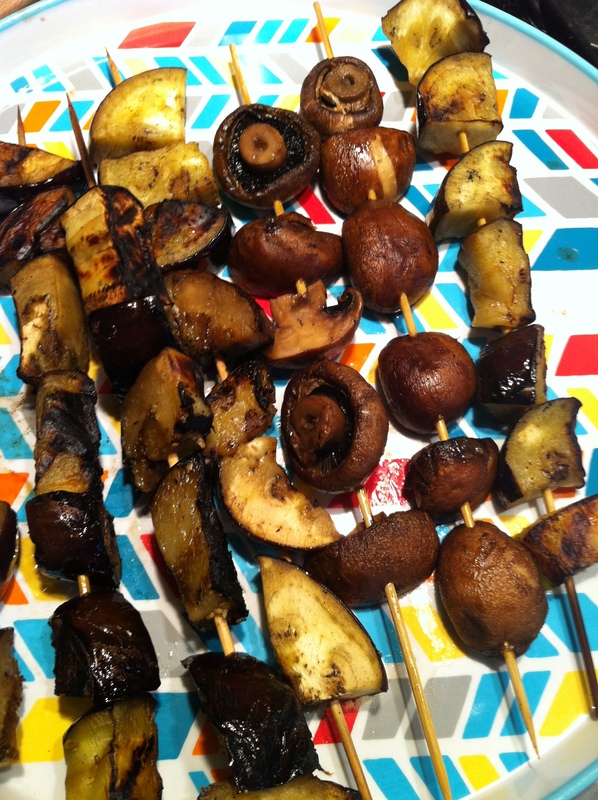 How ’bout steaks and veggie kabobs on the grill? Organic veggies, natch. But the steaks? Well, what we need to figure out is: if we have a last minute desire to throw some steaks on the grill — where can we go to get humanely raised, local meat ASAP? I suspect I need to start keeping my freezer stocked. A visit to Seven Sons in Roanoke is on my ASAP to-do list. I’ll keep you posted. 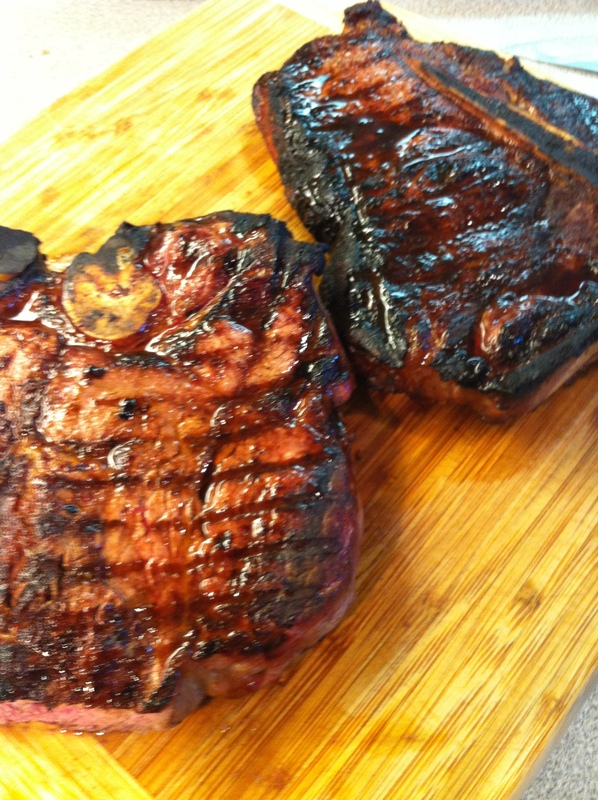 These porterhouses are from Fresh Market because it’s super convenient to our house and the meat is tasty. BUT, it does not meet our official Rules and I still feel guilty. Also, I really missed having yet another opportunity to bend my kids’ ears about what a nice life this animal led before it came to our dinner table (they got an earful about the chicken the night before). ← Day 11. Bread Success and a Berry Farm.